The Brain Diet: The Connection Between Nutrition, Mental Health, And Intelligence is written by Dr. Alan Logan, a naturopathic physician and member of the Harvard Medical School’s Mind-Body Medical Institute. This expanded second addition of his best-selling book, The Brain Diet, contains the latest research regarding the way that nutrition influences brain function and mental health. The book includes recommendations on how to eat for a healthy brain as well as information about specific nutritional supplements that may enhance our mental function. Logan states that we can improve the quality of our lives by making sure that our diet contains adequate amounts of the foods and nutrients that nourish our brains. By supporting our cognitive system we enhance functions such as learning and creativity that can ultimately increase our enjoyment of life. Additionally a brain healthy diet can increase intelligence and reduce the risk of attention deficit disorders in children. Says Logan, “If I had to pick only one dietary factor that could change your psychological condition, omega-3s would be number one. The brain is 60 percent fat and come retirement age or sooner, if you haven’t deposited enough of the good kind of fat—omega-3s—there is a greater risk of mental disease.” Foods high in omega-3 fats include sardines, salmon, flaxseeds and walnuts. Vibrantly colored fruits and vegetables also rank high as foods that are scientifically proven to exert protective effects on our brains. The Healthy Brain Diet especially recommends purple foods like blueberries, acai, plums, grapes and eggplant because they are high in antioxidants call anthocyanins. Suggestions are also provided regarding cooking methods in that steaming, boiling and poaching are preferred over higher-temperature techniques like grilling, baking or frying. This is because when foods are exposed to very high temperatures there is an increased production of chemicals called AGEs – advanced glycation end-products – which contribute to inflammation and oxidative stress that can negatively affect the function of the brain and cardiovascular system. We are advised in the Healthy Brain Diet to eliminate red meat or cut it back to a maximum of one serving per week, avoid simple sugars and refined carbohydrates, avoid alcohol, and limit the intake of safflower, sunflower and soybean oils. Anchovies, salmon, sardines, brown rice, whole wheat pasta, flaxseeds, black sesame seeds, walnuts, black beans, red beans, kale, spinach, blueberries, acai, plums, grapes, eggplant, red pepper, tomato, soy milk, low-fat yogurt, goat cheese, turkey, chicken, egg whites, grass-fed beef, olive oil, garlic, turmeric, green tea. A healthy brain diet recommends moderate exercise because it improves wellbeing, can relieve depression and anxiety and may also promote the growth of new brain cells. Yoga, Tai Chi, dance and walking are especially highlighted because they can also help to reduce stress levels. 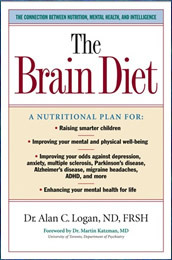 The Brain Diet: The Connection Between Nutrition, Mental Health, And Intelligence retails at $22.95. Click Here to purchase a discounted copy. Eating guidelines will specifically improve brain health but also general health. Provides a detailed explanation of the role of omega-3 fats in a healthy brain. May assist with the management of attention deficit disorder. Reduces the risk of developing Alzheimer’s disease. Encourages the consumption of breakfast. Includes unique information about the foods high in AGE’s: specific brain damaging compounds. Provides advice about nutritional supplements to improve brain health. Requires elimination of desserts and alcohol. Will not appeal to readers who prefer a structured program. Does not include precise exercise guidelines. Weight loss may be slow on this plan. The Brain Diet: The Connection Between Nutrition, Mental Health, And Intelligence provides information about how to improve the health of our brains by choosing brain-nourishing foods and using certain nutritional supplements. The advice provided in this healthy brain diet will promote general health but more specifically may prevent disorders related to brain function, as well as promoting optimal cognitive performance and mental wellness.